Happy New Year everyone! And boy is this gonna be another long, year! 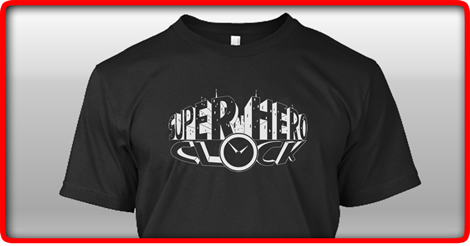 (Well I know every year has the same number of days but... y'know what I mean) So, to kick off this 2016, the Super Hero Clock t-shirts are finally up on sale on Teespring! Just choose and click on the one you want to buy below! Price is $19.97 per shirt and there are a few colors to choose from besides black. Aaaand now that episode 1 is done, it's time to work on episode 2! There's still nothing much to talk about for episode 2 because I'm only working on the script and early stuff but I'll definitely post some WIP's when I get to the animation part. Also, from now on, I'll be instantly publishing new Super Hero Clock episode videos for all Patrons over at my Patreon. So if you are one of my Patrons, you'll be one of the first few people who get to watch new Super Hero Clock episode videos before anyone else exclusively on Patreon. To become a Patron, head on over to my Patreon page!